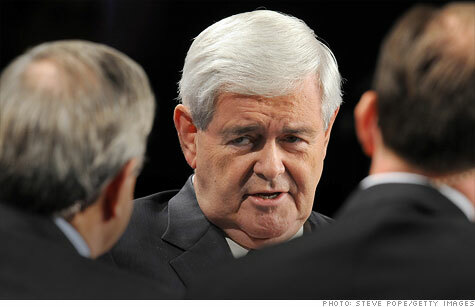 NEW YORK (CNNMoney) -- Look out budget wonks, Newt Gingrich is comin' for you. The former Speaker of the House labeled the Congressional Budget Office a "reactionary socialist institution" during a speech on Social Security reform in New Hampshire on Monday. Given to rhetorical flourishes, Gingrich has made clear he is no fan of the CBO. But this was new territory for the former long-shot candidate who has recently surged in the polls. "The Congressional Budget Office is a reactionary socialist institution which does not believe in economic growth, does not believe in innovation and does not believe in data that it has not internally generated," Gingrich said. Exactly what is Gingrich labeling a "reactionary socialist institution?" The CBO's mission is to provide Congress with information on budgets and the impact that legislation will have on government finances. The agency is frequently described as "nonpartisan" and "objective." Generally respected by politicians on both sides of the aisle, the CBO acts as an official scorekeeper of sorts on budget issues. Douglas Holtz-Eakin, a former CBO director and Republican, called the Gingrich allegation "ludicrous." "I think if you parse that phrase carefully, he got one out of three right," Holtz-Eakin said. "I do agree it is an institution. If you're playing baseball, that's a decent batting average." Stan Collender, a former Capitol Hill aide who worked for the House and Senate Budget Committees, said he was "stunned" that Gingrich would describe the agency as socialist. "He should know better, and he should be ashamed of himself," Collender said. "The CBO is the best group as analysts I've ever met. They are bipartisan. Their only job is to get it right, and they do." A spokesman for the Gingrich campaign did not immediately respond to a request for comment. Collender chalked up Gingrich's remarks as campaign year electioneering. "When you are appealing to the far right wing of the party, inflammatory adjectives become important," Collender said. Donald Marron, a former acting director of the CBO, was vexed by a more technical aspect of Gingrich's comment. "I thought reactionaries were anti-socialism?" he quipped on Twitter.